Prophet 12, Hybrid synthesizer from Dave Smith Instruments. Tomavatars's review (This content has been automatically translated from French)" Beautiful, educational and fun"
All features have been presented in the test and uncompromised Synthwalker prior reviews. For my part, all the features are really good. It actually lacks in audio that would have been good. I wish the factory bank is collapsible, but it is not a drama. What bothers me however, is unable to determine that the layer A does so only when the output A output B is connected. Indeed, the first six voice output via the output A and the other by the six output B. This is annoying when you want to freeze a track in a DAW, is obliged to disconnect the output B is obliged to freeze two tracks. This is the advantage of the Prophet 12, the general configuration is simple and easy access to detailed editing can be very complex. This is a true Swiss army knife for understanding a lot of things on the synthesis and is very fun and easy to use. Over all functions are well distributed on the control panel and everything is very clear and beautiful in addition, the screen is very well defined. Finally, the two sliders are a big asset being sensitive to the position and pressure, these two controls plus standard wheel and pitch are a wonderful instrument performance. We tend to say it sounds cold, it is not wrong but it is largely possible to make it sound analog with work. The sound suits me perfectly, as to make industrial music, this is a gem, as to what you want actually. Personally, I use right now to make sounds Jean Jacques Perrey to and it is broke. Frankly, it is wide and it goes where you want. Albeit with some work but it is the least of it. This is not an emulator that's for sure. A little note to say it is very easy to get very dirty and industrial sounds, we must work in subtlety, so do not be fooled by the character section. I use it for two months, and I always start from scratch (basic patch - simply by pressing latch and hold at the same time, it is very convenient). I created over 200 patches, most are tests and experiments, but between two very similar patches can be a world of difference. This is my first hardware synth. I've had little shits but never been able to develop as I can here. Here is a permanent lesson. With lessons synthesis Gordon Reid is tiptop! I love everything about this synth, except that the team has released perhaps a bit too early, as it still requires a lot of updates to the bone. It is expensive for sure. But I think it is worth the price just for the finishing of the machine and its capabilities - still, 12 voice polyphony, oscilloscope by four layers, this is huge! I would do this choice without hesitation. 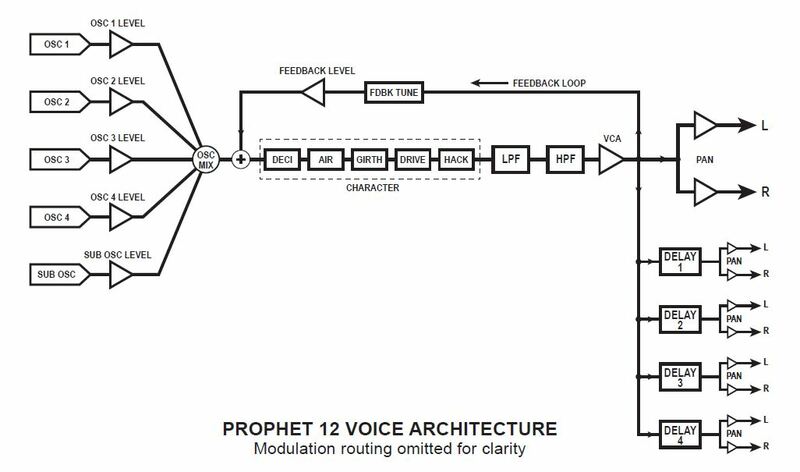 JiMMyPulse's review (This content has been automatically translated from French)"The Modulator"
The Prophet 12 is now facing the high expectations he generated his presentation at NAMM 2013. Many had imagined he would be a versatile synth par excellence. It is not really, but it Recelle many possibilities. See test Synthwalker for more technical details. The touch keyboard is of good quality, perfect finish, nice and expressive playing with aftertouch, two sliders that can be frozen in latch, three pedal inputs (2 sustain and pedals) and all knobs on hand. It is cool. Internal power etc ... Two stereo audio outputs. Split Stack two sounds with settings 100% independent, but can also be linked. I was looking for a keyboard to create complex textures without delving into menus or use VST extensions. Simple setup, really almost everything falls naturally under the fingers. I sometimes from an interesting patch, but in principle I like to start by scratch. That is to say about 396 patches of P12, only forty are valid. The rest not really seem consistent with sound level (not classified and created on the OS development) and finally not enough to seller who wants to test in store, however some use well modulations. Forget the patches if you want to test a flash, but consider the keyboard to what it really is. However DSI could indeed have treated a little better the factory sounds. Sound: it is enclun to warm cold, mild corrosive metal complex and percussive. Finally it&#39;s a bit what I was looking for the experimental, industrial electro, ambient and electro-wave. But I guess those looking for a warm sound, smooth and analog does not find it easily. However there way out of the pad sounds, bells or keys quite nice with good fine tuning, as well original and sometimes super brutal and atmospheric sounds or intros. This is not a keyboard like this: I turn, I take a patch factory, zouuu I have a lead sound of hell and I&#39;m hallucinating friends. And yes the patches ... makes finding valid, but ultimately we do not buy such a machine for just making factory patch ... the goal is to make your creative work. 4 times, I do not touch it too much, probably their precise function still eludes me (though as you know I use this kind of effects), but there has digital artifacts when they exceed a repeat AND one second when synchronized to the south (it is explained in the manual). Or, if you prepare a valid model of his, and if somehow you do the external effects processing (Daw etc. ..), which is my case. DSI should have given a more largesse to the effects section and to dedicate more time in development. aliasing on the high notes (from the sixth octave). But should these two conditions and listen to his solo to hear. Once in the mix this aliasing does not intend to. Filter Bleed: yes a good bit, but honestly it never bothered me on other DSI machines. especially with this lovely OLED screen there way to do something. Some thing like the programmable Blofeld example. It also lacks an out MIDI notes of the arpeggio. Come on, this is only the coding right? It seems that a new OS will enrich this section, as announced by DSI, I cross my fingers. A lack in the low end, but it glues together in EQ in the mix. No sequencer annoying for those who need it. No use to me, since I use external sequencers (Octatrack, MachineDrum or my DAW). No Line IN: ditto above. I also would like other users running a dual MIDI in and out for both layers sound channel. You turn, you take leave of you and nothing creates a sound that almost everything on hand. A pleasure to use. Oscilloscope with 4 + Sub tilt and every imaginable modulations is very rich and deep into opportunities. The Character section is interesting to grow and prune the sounds, but do not abuse too much of these effects together. The palette distorde sounds (distortion, drive, characters, modulation) is effective. Powerful unison mode, but unable to select a number of tracks / given voice, it&#39;s either all (12 (or 6 if two sounds are enabled), or. Yes, I&#39;m satisfied. This is not the final shot lightning and absolute (as my Analog Four which is my highlight for 2013) but it has found its place in my sound set and ultimately that&#39;s what I needed. Take a little time to tame sonically while having limitations in oeuil areas. But once you put it, sounds are effective in their registry, rich in texture and easy to develop. 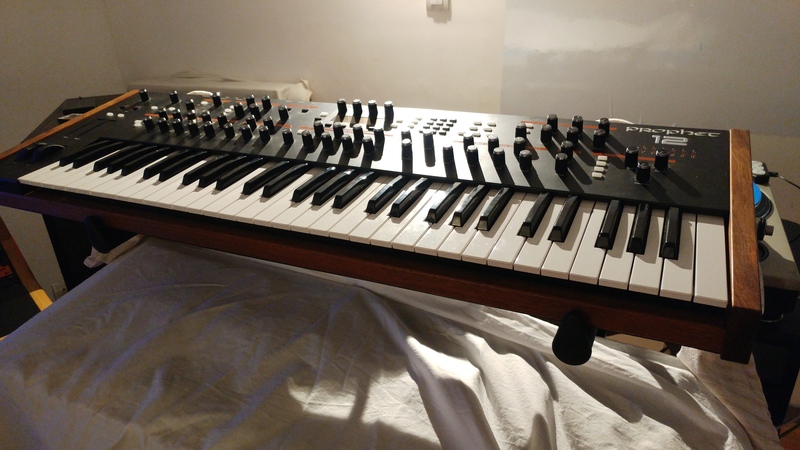 minouagrifffe's review (This content has been automatically translated from French)" a new sonic stew ..."
semi analog synthesizer. very large potential in terms of programming. there are many things to mumuse. many embedded technology under the hood but it tastes digital. the first impression is rather 'the tree which hides the forest.' I'm still looking for that tree! perfect for the cold and distorted synthesizer sic. a small drum machine "tempest" and more and you're ready for a 'rave' in Siberia. for musicians to armored ears, synth appropriate to develop complex modulated textures. thank you for dave modulation matrix. but many buttons does not necessarily happier. the factory syndrome Gas is not far. a prophet 5 is perfect. why look noon fourteen hours! it's sad to say but the prophet 12 is a reflection of his colleague "tempest". we are in 2013 and today's synths are blades figures to their ancestors 80s. 12 the prophet has a very unpleasant sound. (cold, strident). certe should be for lovers of cold and harsh sounds. techno style. 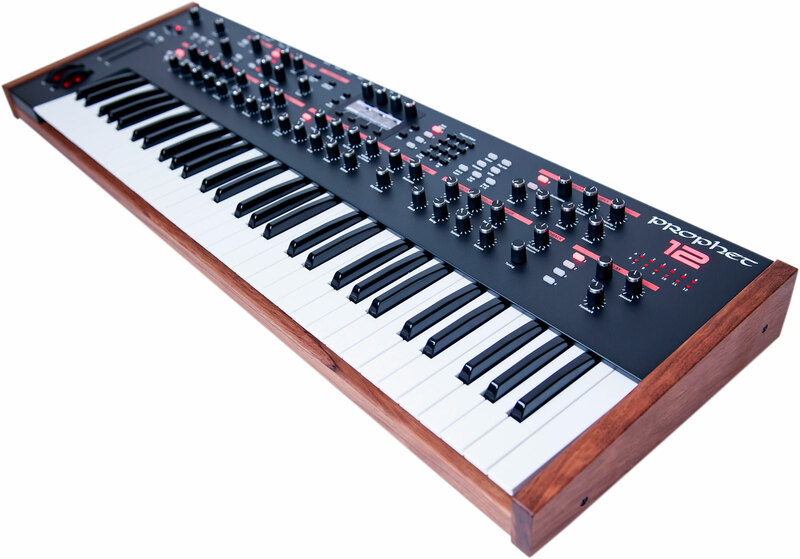 the prophet 8, so often criticized for having only the name in common with his legendary cousin (prophet 5), has a more interesting as his successor his 12 votes. and yes, more buttons and more parameters are not necessarily more musicality. it's sad to see. an engineer able to develop a sublime Machine (prophet 5), we meet a wonderful machine, but that aspect has made without interest. the advantage of this is to highlight the sound qualities of certain machinery often underestimated (roland d110, roland jd 800, prophet 8). lack of thrushes blackbirds eat. it leaves us no choice. will still have to buy the old analog cuckoos (5 prophet, jupiter 8, casio rap) for "THE SOUND". go dave, I expect you to do us a true prophet 5. not matter if it costs 6000 euros to the exit. I hope I will not be dead by then. if you have the means, the prophet is to buy 12 to admire in a corner. the rest will take courage to be inspired by the sounds. I have nothing against you dave. your friend with his roland jupiter 80 is much better. Come on! I'll go to my friend with his Yamaha DX7 nice, it builds digital sounding warmer. Mr Kay's review (This content has been automatically translated from French)"I modulate, then I am"
I watch at the DSI product line for several years and there is serious progress in built quality. Following the unfortunate experiences of the P'08 and Poly Evolver, they've directly issued a "pot edition", leaving encoders only on some parameters, the power supply is internal. The overall design is homogeneous with beautiful wooden sides and front. Such as construction, ergonomics has been greatly improved over previous models and the perfection we frieze, I only watched the manual once or twice. The relationship between the knobs and the screen provides quick access to all settings very smoothly, without getting lost in the menus / submenus, a feat considering the wealth of the engine. As if that were not enough, the key benefits from the input of the Tempest, two touch sliders that can be assigned to have what you want and equipped with a "latch" button to freeze the value. We also appreciate the "hold" button that can be sustained indefinitely an agreement, a loop of arpégiatteur, leaving both hands free to turn the knobs and work fine textures. Another significant point is that leaving pressed a button on a tilt, a LFO or delay, can individually change a setting or four at once saw. It is a synthesizer, so for the "realistic" sounds, forget it. - The "slop" parameter (simulating the behavior of a VCO) is much more efficient and by individual oscillator, it can also be applied to the wavetables. This technical choice also solves the famous problem of "filter Bleed" (sound passing the filter even when totally closed), I did some tests at the request of some users, there are still a little bleed, but at absurd volume and it is insignificant compared to my Mopho Kb (where the bleeding is imperceptible in my normal use). Quick tip, pay attention to the master before pushing frankly feedback or activate the unison mode! Upon arrival, there was a chameleon, can make good his big fat well, tablecloths majestic, the suspicious sounds typically "prophétiens" sound more right than I could have on my Nord 2X and other things crazy we can get by stacking the oscilloscope, layers and modulating all in all directions (DSI synths are known to be modulatory orgies). I have this machine for the past month and a half, it is likely that I come back later, I would have explored more and some updates to the OS have been made, correcting the last residual small bugs and adding features . More recently, I tried a King Korg, but I would not have sold my MS-2000 for it due to the stripped down interface. I felt by the Nord Lead 4 overpriced and would have prefered a Nord Wave II improving it predecessor. And that day, there was a Poly Evolver in the shop, remembering that among the synths I've tried so far, this one was by far my favorite. Knowing that the Prophet 12 keeps most of the concepts, I took the risk to order one without trying. If I have any regrets, it is the lack of the sequencer, but changes in the OS to enrich arpegiator seem planned, and then we can consider using a Doepfer Dark Time, more intuitive sequencer usually built in on the DSI. I would also have appreciated the opportunity to put the two filters in parallel to get me a notch filter. 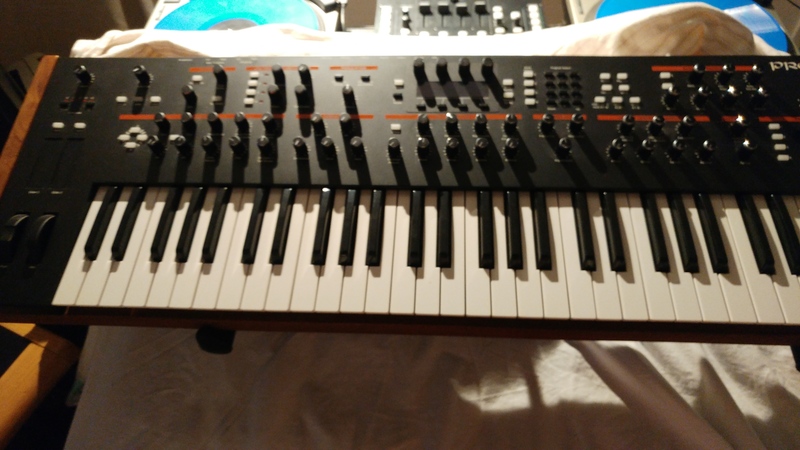 The machine is not given, but it is very reasonable for a synth of this caliber and manufactured in small series in the U.S. (incorporating inflation, the price of a Roland Juno 106 at its release). So if I were doing, it would without hesitation. Dave Smith Instruments has released a new operating system for the Prophet 12 hybrid digital/analog poly synth, adding several requested features. Comments about the review: The Magnificent!